Portugal has sent its keeper Patricio into the box and he gets a head to it. But no. We’re well past the four minutes. Quaresma from 10 feet ... but it’s straight to the keeper and saved. Quaresma of Portugal really, really wants a foul called when he’s brought down outside the box by Stuani. The ref, who has let them play in this game, says No. Here’s an update to frighten Uruguay fans: Ronaldo shoots. But it’s from far out and wide. Four minutes of added time. Uruguay breaks two-on-one, but Portugal scrambles back on defense before they can get anything much going. Fernandes figures he’ll try a shot from way out. It’s on net but saved. Portugal starting to look a little desperate. He leaps high just in front of goal for a cross from Bernardo Silva, but it is just barely too high. A lot of midfield dueling at the moment. Time is not Portugal’s friend. Guerreiro of Portugal from distance but he puts it over. Ricardo Pereira puzzlingly puts a cross opportunity over the endline. Portugal needs to do a lot better. Edinson Cavani, two-goal scorer comes up limping. His rival Ronaldo supports him off the pitch in a nice show of sportsmanship that the crowd cheers. Stuani will replace Cavani for Uruguay. 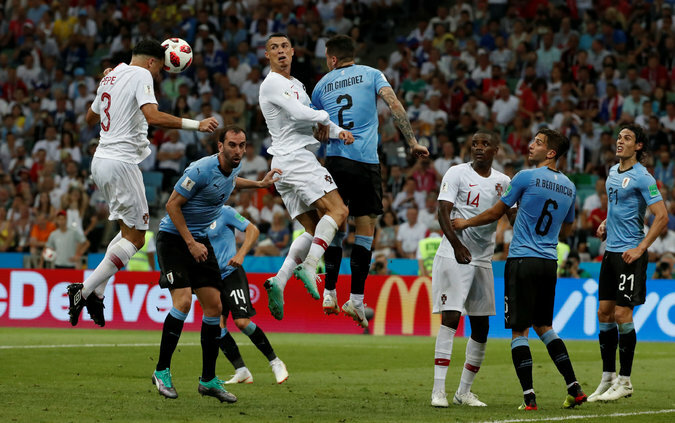 Uruguay keeper Muslera could not get control of a shot and chased it deep into his box. . That left Bernardo Silva with a shot at a clear net. He misfired. Good chance for Portugal. Portugal is throwing men forward, with the ball seldom straying far from Uruguay’s end. Bernardo Silva scoots a dangerous ball through the box, but Torreira is there to boot it away for Uruguay. Pepe, Portugal’s goal scorer, was the guilty party who misdirected that header that led to the goal. A misdirected header gets Uruguay a 3-on-3 break, and Cavani is left too open. He one-times a pass from Nandez. Uruguay back on top, 2-1! It has been defensively focused for most of the game. In the meantime, Portugal remains on top with the better of the ball. A short corner, a Guerreiro cross and it’s Pepe who leaps for the headed goal. Guerreiro tries a long shot for Portugal. Too high, too wide. Ronaldo gets the ball with a little bit of room to maneuver, which draws a yell from the crowd. A few passes later, Ricardo Pereira’s cross to a waiting Ronaldo is broken up. Will Ronaldo find a way? Lionel Messi was knocked out of the Cup earlier today. Ronaldo may follow in 45 minutes. Uruguay 1, Portugal 0. Portugal chased the game for 40 minutes. That’s reflected in the stats: it led 8 to 4 in shots, and 60-40 in possession. But it failed to get a goal, and Uruguay remains on top. Portugal takes a short corner and eventually the keeper Muslera gets to the ball instead of Pepe. Suarez goes down with a howl after taking a shoulder from Gurrreiro. The game goes on without him and Portugal gets a corner. The physio is on the pitch to have a look. Guedes of Portugal leaps for a ball but his header is errant and, worse, he smashes heads with Godin. Ronaldo calls for the ball, and Guerreiro tries to accommodate him, but he sends it into the box well short. For those who don’t watch the game regularly who are puzzling over Ronaldo’s shorts: Yes, he likes to pull them up sharply at the sides on occasion. He did so just before that free kick, but it did not seem to help. A vigorous objection from Uruguay to a foul on Bentancur. Free kick just outside the box and Ronaldo to take. But he drills it into the wall. Bernardo Silva earns a free kick. William Carvalho whiffs on the header off it though. Uruguay gets a free kick from just outside the box. Suarez scoots it through the leaping wall and forces a diving one-handed save. Suarez collides with Guerreiro and goes down hard. He holds his head, but fails to draw a foul. Remember after his infamous bite, when he held his teeth as if he were the injured party? Ricardo Pereira of Portugal crosses right along the endline, but it’s to the keeper. Fonte of Portugal gets a foot in and foils Suarez by goal. That leads to a corner that goes nowhere. Portugal crosses it to Fonte in a dangerous position just in front of goal. He puts his hands on his defender, Vecino, to get more height, gets his head to the ball, and drills it far wide. Cavani crosses the ball completely across the field, Suarez collects, stutter-steps a couple of times, then whips the ball ... back to Cavani, who has raced to goal! He heads it in. Spectacular! Cavani got his first goal of the Cup in injury time of the last group game. Seven minutes later, he’s got another! Andrew Das: Cavani starting that play on the touchline with a cross field ball to Suarez and getting the return at the post is some hard work right there. Longest give and go of the World Cup. Ronaldo tries out his shooting boots! It’s from outside the box though and straight to keeper Muslera. They’re at it already! Godin pushes down Pepe. Just a talking to from the ref. Uruguay wastes a corner. Some of Ronaldo’s trademark fancy footwork leads to a series of bullet passes that lead to a good cross by Joao Mario followed by a bad header by Bernardo Silva. Uruguay in sky blue, Portugal in white. We’re unlikely to see the seven-goal deluge of the early match, but we should expect a hard-fought match with two teams giving everything to win. While we’re expecting a hard-fought contest today, either of these teams will be a decided underdog in its next match. That will be against France, which showed plenty of offensive firepower in its 4-3 win this morning. You can relive all the excitement here. If you think you’ve seen a lot of Ronaldo in big matches over the years, you are right. This is his 38th appearance at either a World Cup or European Championship. That ties Bastian Schweinsteiger of Germany for the record. Beyond the big names, two more players to watch are Diego Godin of Uruguay and Pepe of Portugal. Soccer doesn’t have a tradition of ice hockey-style “enforcers,” but these guys come close, marking the other team’s star, tackling hard and sometimes stirring up trouble. Though Luis Suarez has the rep of the firebrand, it’s probably a better bet that Godin and Pepe will be in the middle of any brouhahas. Portugal and Uruguay don’t face each other very often. In fact they haven’t done so since 1972, in something called the Brazil Independence Cup, which celebrated Brazil’s 150th anniversary. They drew, 1-1, and Portugal went on to lose the final to Brazil. Three wins, no goals allowed. It beat Egypt and Saudi Arabia, then drilled a previously impressive Russian team, 3-0. • For Portugal, this is a return to the knockout stage after disappointingly failing to make it there from a tough group four years ago. Uruguay has qualified for its third straight knockout round. In 2014 it lost to Colombia at that stage, 2-0. • After playing the game of the tournament, a 3-3 draw with Spain, Portugal beat Morocco, then was surprisingly held to a draw by Iran. • Ronaldo had a hat trick in the Spain game and added a fourth goal against Morocco. He missed the chance to add to that total when his penalty was saved in Game 3. He trails Harry Kane of England by a goal in the race for the Golden Boot. • The Uruguay strikeforce of Luis Suarez and Edinson Cavani is rounding into form. Suarez scored in Games 2 and 3, and Cavani waited until injury time of the last game to get on the scoreboard. 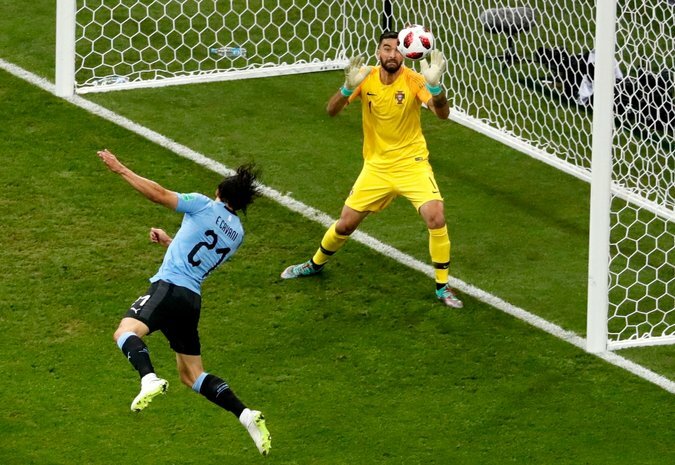 • Another talented Uruguay duo is center backs Diego Godin and Jose Giminez, who along with keeper Fernando Muslera have kept their opponents scoreless. Giminez also had a goal in the team’s first game. • This game is rated basically a toss-up by bookmakers, although Uruguay is a very slight favorite.